So fortunate to be invited to Inner Journey with Greg Friedman again!!! This time with Nhan Khuong to share about EarthSky People. Thank you so much, Greg Friedman! “Imagine using the most powerful secrets of nature to enhance your life. 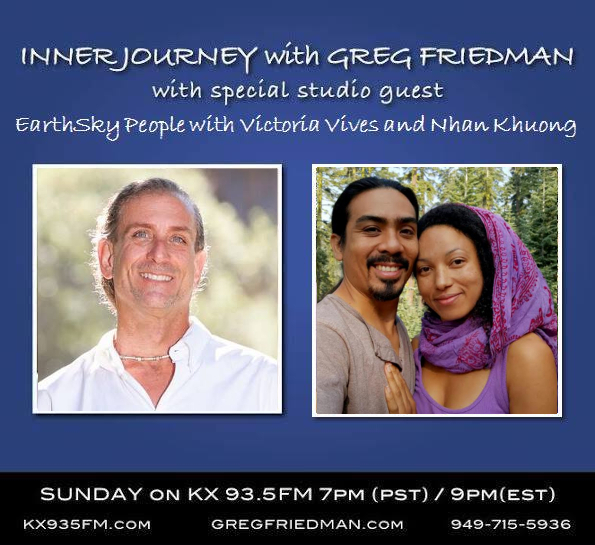 Join Greg Friedman this Sunday night from 7-9pm (PST) on Inner Journey with Greg Friedman as he uncovers the vision behind Earth Sky People Intentional Community with founders Victoria Vives and Nhan Khuong. EarthSky People Intentional Community is a community-based movement facilitating a social, spiritual, and philosophical paradigm shift to promote harmony and consciousness.